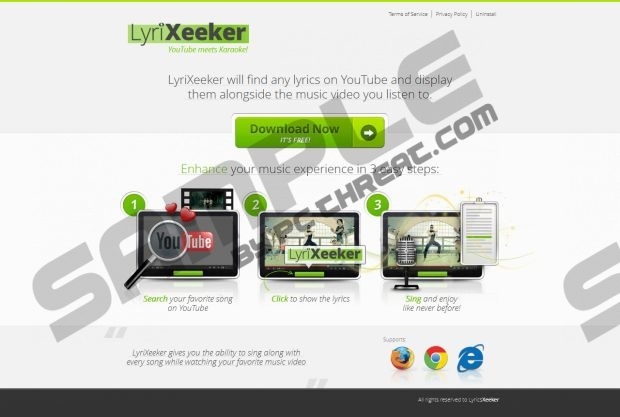 Lyrixeeker.co is a website where you can find a browser add-on that works on Internet Explorer, Mozilla Firefox, and Google Chrome. The function of the application is to provide the user with the lyrics of the video he or she is watching on YouTube. It is a regarded as an adware application, and its installer is likely to be blocked by your internet browsers. As you may tell, the application Lyrixeeker is related to advertisements, and it has been investigated that it installs a tracking cookie called yieldmanager.com and an adware application that generates advertisements which reads “Ads not by this site”. Needless to say, you should remove the browser add-on acquired from Lyrixeeker.co, especially if you want to browse the Internet safely. The browser add-on from Lyrixeeker.co may monitor your browsing sessions and collect non-personally identifiable information. By agreeing to install Lyrixeeker, you agree to have the settings of your internet browser changed. According to the License Agreement, Lyrixeeker.co, or Lyrixeeker may change the home page and default search engine of the browsers. Moreover, the new webpage may be set as a new tab. Some users complain that their browsers are modified by Delta Search, and if you also have this problem, do not wait and implement a powerful spyware removal tool to remove the browser hijacker and the unwanted browser add-on. It is also important that you ignore the so-called “Ads not by this site” advertisements because they are generated in order to help website owners earn money from every click. Ignore annoying advertisements remove this potentially unwanted application. It is not enough to uninstall the program, because the additional components such as the tracking cookie and the adware program remain on the computer. It is highly advisable to employ a powerful spyware removal tool in order to have all the harmful files removed from the PC. Our researchers recommend using SpyHunter because this application is all that you need. It can remove adware programs, tracking cookies, and many other undesirable threats. Moreover, it can easily fight various malware or spyware attack off and save your time, so if you are looking for a reliable and powerful tool, you have come to the right place. Do not wait any longer and remove the Lyrixeeker.co application right now. Click Uninstall a program and uninstall the unwanted program. Click Control Panel and click Add or Remove Program. Having uninstalled the Lyrixeeker.co application manually, implement the recommended application in order to remove the rest of unwanted and insecure application. Quick & tested solution for Lyrixeeker.co removal.